Oh yes! 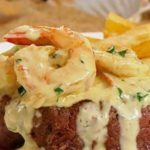 Surf ‘n’ turf: There is nothing more American than to enjoy a plate full fillet steak with garlic shrimp most commonly referred to as a ‘surf ‘n’ turf’. In terms of Italian food, ‘surf ‘n’ turf’ could be described as an extremely distant cousin to mountain and sea dishes … sort of. The surf ‘n’ turf is an extravaganza of meat and fish. When eaten out at a local restaurant, it will often be the most expensive item on the menu. 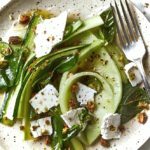 Many surf ‘n’ turf combinations will be created from the best cuts of meat often beef steaks, and giant shrimp or lobster – the best shell fish that money can reasonably buy. The term surf ‘n’ turf may have originated along the Atlantic coast of America during the 1960s to help restaurants advertise the range of food available on their menus. Wherever it came from, the term is still used today. In fact, it is so successful a term that the Australians invented their own. 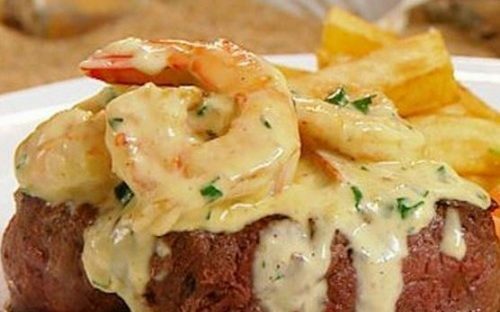 There, our fillet steak with garlic and shrimp would be referred to as a ‘beef ‘n’ reef’. Heat half the oil in a non-stick frying pan over medium high heat. Season the steaks with salt and cook for 4-5 minutes each side. (Be sure to seal the edges of the steak as well.) Cooking time will depend on how thick the steaks are and how you like them cooked. Remove from the pan and keep warm under foil. Heat remaining oil in the same pan and cook shrimp 1-2 minutes or until just cooked through. Remove from the pan and set aside. Lower the heat to medium and add butter and garlic to the pan; cook gently until soft. Stir in wine and cook for a further minute. Add cream and pepper and cook for a further 1-2 minutes. 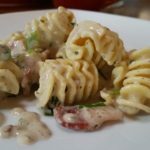 Dissolve cornflour in a little water and stir into the sauce to thicken, a little at a time, until desired consistency. Cook for 3-4 minutes until thickened and the cornflour has cooked out. Taste and adjust seasoning. Toss the shrimp and parsley into the sauce and heat gently until warm through. 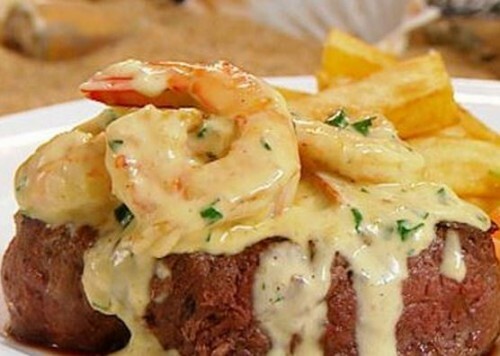 To serve, place steaks onto each dinner plate and top each with 4 shrimp and a good dollop of cream sauce.